Why Does Hollywood Ignore The Collapse Of Communism? 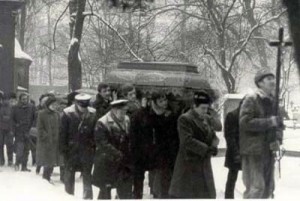 On a freezing December day family and friends trudge through snow carrying a coffin to the edge of a bleak graveyard. Ten other coffins follow behind. Eleven men are being buried on that wintry morning, eleven miners shot by police and soldiers, crushed by a brutal regime for daring to demand the right to strike in defiance of a decree promulgated by the ruling elite. It is an iconic image of working class families beaten but unbowed by the vicious and ruthless security apparatus of an authoritarian government. Off camera hard eyed riot police ensure that the funeral does not transform into an anti government rally. Plain clothes security officers and police informers mingle with the crowd listening out for any whispered manifestation of discontent. Wives, mothers and children of the slaughtered strikers sob quietly for their lost ones. Grieving fathers, brothers, sons and fellow miners mourn in bitter silence, fearful of saying anything that would bring police batons smashing onto their heads…. But if those chains have been hung on you by Communist rulers – that doesn’t fit too easily into the world view of some on the left. So the Chomskys and the Redgraves and the Fondas tend to put it outside their vision – they ignore it…..and thus what appears to be one of the major seismic events of the Twentieth Century, the political and intellectual and moral collapse of Marxism in Europe has never been the theme of any major western movie or music album. Nor has there been any artistic declaration of regret or plea for redemption from those in America and Western Europe who for decades prostituted their intellect and values by acting as cheerleaders and apologists for the bullies, thieves and torturers who ruled the Soviet empire and it’s lackey states. The miners at Wujek were striking as an act of defiance against General Jaruzelski’s declaration of Martial Law in December 1981. 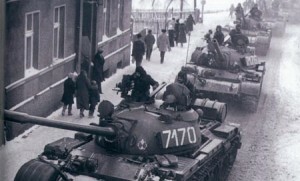 The General had become Prime Minister determined to crush all resistance to the Communist regime after several months of strikes and demonstrations. Unofficial trade union activities were banned, thousands of people were arrested and dragged before military tribunals and strict censorship was imposed on all forms of media and communication. Tanks and heavily armed soldiers and special police units patrolled the streets in an aggressive and confrontational manner and the government decided to deal with the miners of Wujek in a way that would send a lesson of fear and terror to all its opponents. The miners had occupied the mine as a demonstration of defiance against the regime. 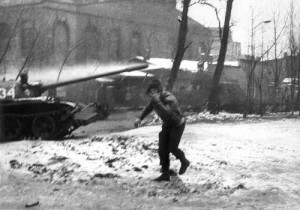 A huge force of soldiers and riot police, accompanied by tanks and armoured cars, broke into the mining complex. The miners resisted fiercely, fighting back with picks, shovels and bricks. Finally an officer commanding a special police unit ordered his men to open fire on the miners, killing eleven of them and wounding many more. This broke the strikers resistance and the mine was brought back under government control. There were critical comments in the west but the Marxist/Leninist regimes had long ago discounted western “opinion” as empty rhetoric. Jaruzelski , like all communists, believed that bullets were more effective than words when resistance needed crushing. He even solicited advice from Hungarian colleagues who had organised the repression of the 1956 anti communist uprising. He also took heart from western communists like the British miners union leader Arthur Scargill who remained silent over the fate of his fellow miners in Poland. One day, perhaps, the implosion of the Marxist/Leninist charade will attract some future Victor Hugo or Charles Dickens to chart it’s ignominious collapse in soaring prose and golden epithets. For the time being, unfortunately, we shall have to put up with Sean Penn…..
At least it might be claimed that those eleven Wujek miners and others killed by Poland’s communist security forces did not die in vain. Poland is now a lively democracy and a member of NATO and the EU, free at last from Marxism’s iron grip. The remnants of the Jaruzeski regime are mostly mouldering away in ignominious retirement. Even better, some former members of the security apparatus have been brought to book for their actions at Wujek and elsewhere. 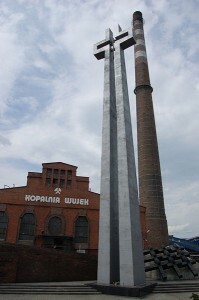 Outside the Wujek mine is a stark memorial for the victims of repression. Who knows, perhaps one day similar monuments will rise up to the sky in Beijing and Tehran…. 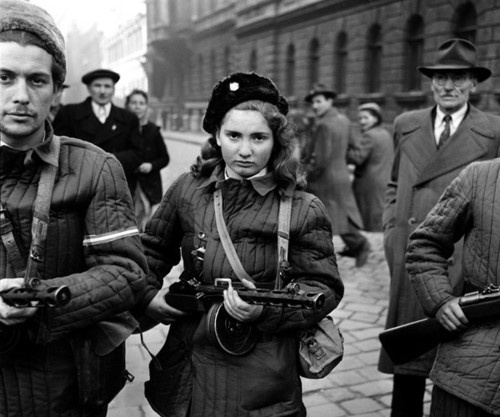 For an intensely moving pictorial and personal review of Polish resistance to Communist dictatorship go here…..